When shopping for that perfect productivity tool to get work done on the road, choosing a laptop and a tablet can be a dilemma. So Toshiba Corp. is trying to solve that problem by creating one device than can deliver the best of both form factors. 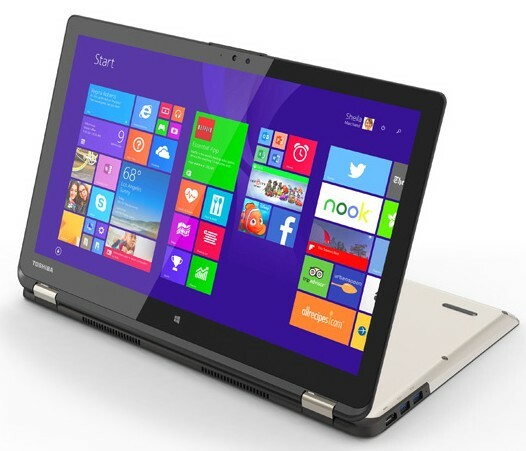 The Toshiba Satellite P50W-B-001 is the newest in its line of convertible notebooks giving the user the ability to switch from the unit being a laptop or tablet on the fly. A smart idea, and a first for Toshiba. While the overall experience is solid, there are a few issues that hold back the Satellite P50W-B-001 from being amazing. Overall, the new Satellite has a very slick design. The aluminium case and backlit, lowered keyboard work well and look good. With a 1.9 cm thickness and weight of 2.2 kg it’s a somewhat bulky machine, especially when used as a tablet (more on that later). In terms of ports, it comes with three USB 3.0 ports, HDMI output, a standard SD card reader, and headphone jack. If you’re planning on using ethernet, you’ll have to buy an adapter. This machine is WiFi only. A volume rocker is activated when the P50W is flipped into tablet mode. 4th Generation Intel® Core™ i5-4210U processor (1.7GHz, 3MB Intel® Smart Cache) with the standard Turbo Boost. As a laptop, the Satellite is on the midrange side. For my review I decided to test drive it using a few of my favourite programs; Photoshop CC, Fifa 14, and Watch Dogs. While Photoshop and Fifa ran well, Watch Dogs gave me some problems, and I could only getting it running smoothly on mid-to-low settings. On the other hand, any “Apps for Windows” (tablet style apps for Microsoft’s touch interface) ran fine with no problems. As a tablet, the 15.6 inch screen is the largest tablet I’ve ever used. It’s almost two big. Because of the size and weight, using it as a tablet requires two hands. On the flip side, anything you are looking at is beautiful, due the 4k display. Luckily, due to the “360” usability of the monitor, the Satellite can prop itself up and use the keyboard as a display, which is great for watching a video or doing presentations. I wish I could have tested out the 4k capabilities more, but there is a considerable lack of content online right now. A feature that would be great to come with the Satellite would be a tablet pen. It would really give the Wacom Cintiq a run for it’s money. Not that’s it’s the fault of Toshiba, but one of the major problems with Windows tablets is the software itself- it’s in an identity crisis. Aside from the modern Windows touch interface, the rest of the system is standard desktop Windows, making running programs that aren’t native apps a little frustrating to use when you’re in tablet mode. But tapping on those smaller menus is mitigated by the fact you’re using such a large screen. 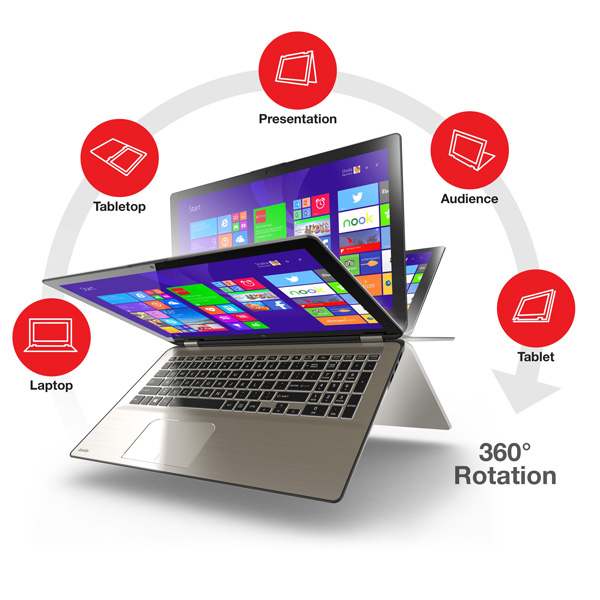 Overall the Toshiba Satellite P50W-B-001 is a solid mid-range computer capable of displaying media in 4k resolution in a slick package, either as a laptop or tablet. Although, the $1,149.99 price point may not be worth is as the content isn’t widely available yet. If you do buy one, be sure to pick up a compatible stylus to really exploit the full potential of this machine.